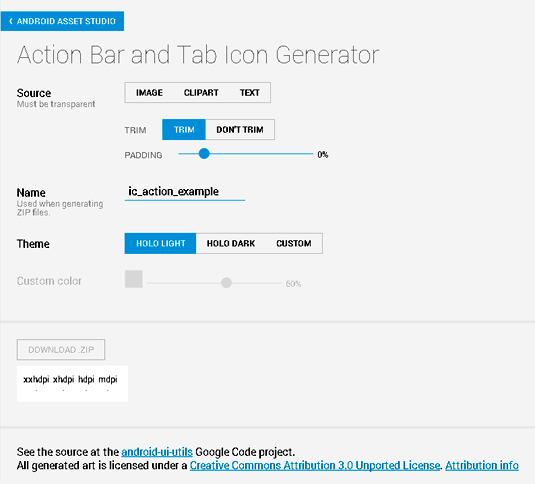 The website Android Asset Studio offers a Java programmer, or any programmer for Android devices, a growing list of utilities to help them create good-looking widgets. Many programmers, like any “geek,” may have trouble with visual elements. For example, fashion sense may be a mystery to them — no one’s clothing looks unfashionable to them — especially not their own. Or when they visit an art museum, they can’t tell a masterpiece from an accidental coffee spill. If you’re a programmer that meets this description, you might also find that you have the same problem when creating apps or web pages. You can develop complicated code to perform fancy tasks, but you can’t make a web page look pretty. No matter what you do, you’re afraid that your designs look bland and uninteresting. 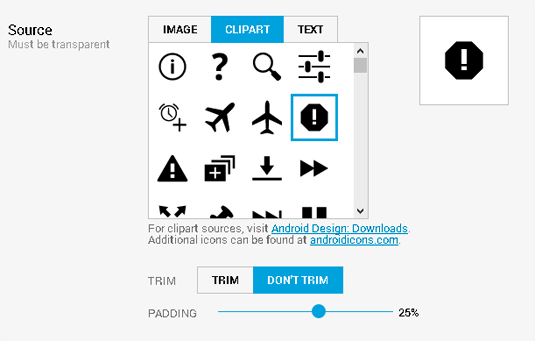 Of you get nervous when you create visual elements for your Android apps: you simply don’t trust yourself to do the job effectively. 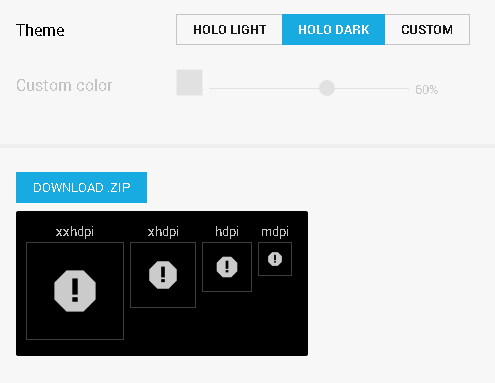 That’s where the Android Asset Studio can help. 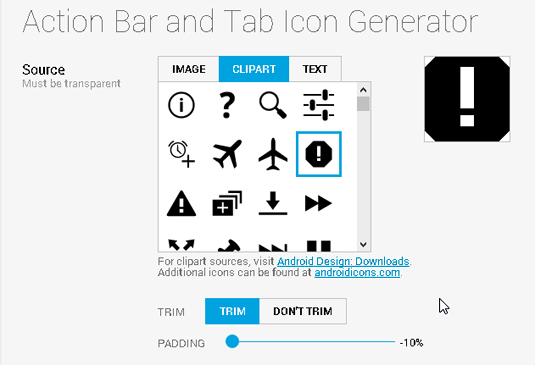 The Action Bar and Tab Icon Generator. 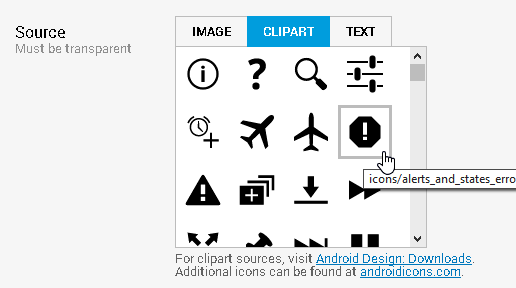 In the Source section, select IMAGE, CLIPART, or TEXT. While you’re still in the Source section, select TRIM or DON’T TRIM. Also, select a padding percentage. No trimming and no padding. No trimming and positive padding. In the Name section, type a name for your new icon. A name for your icon. Four icons for four Android screen densities. 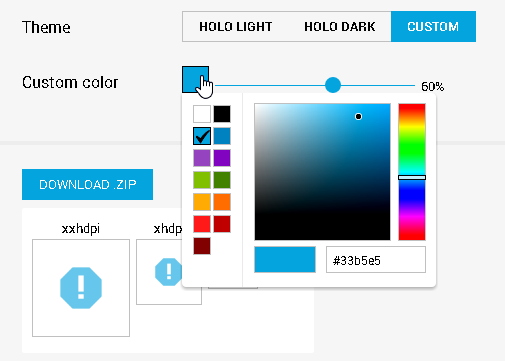 In the Theme field, select HALO LIGHT, HALO DARK, or CUSTOM. 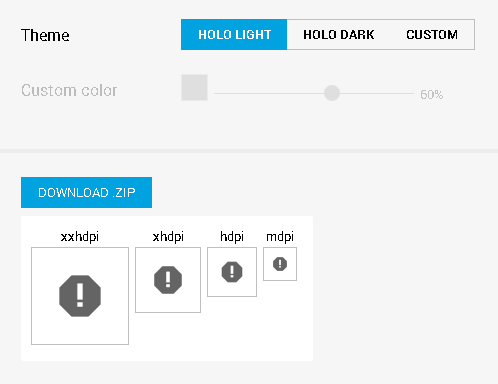 Last (and maybe least), click the page’s DOWNLOAD ZIP button. 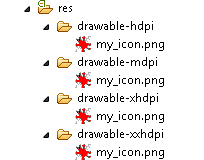 When you do, you get a .zip file containing the icons that you created. 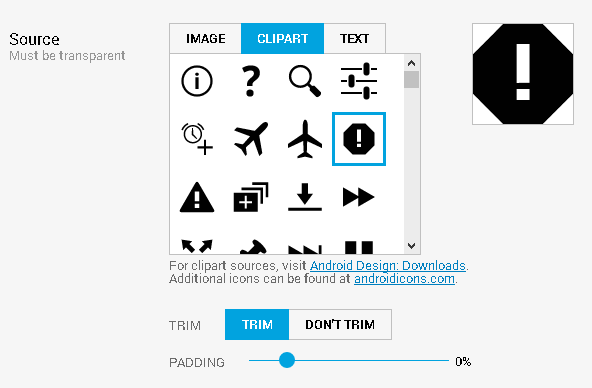 You can paste those icons into your Android project’s res/drawable folders.